Click the dice roller image above or here to download this wicked Outland Arts dice roller. While there are dozens of great dice rollers out there, this PC only specimen is small and doesn’t take up half your notebook computer screen when you are covertly rolling up characters in the library, at work, school or airport. An interesting feature of this roller is that it shows numerous subsequent dice results for each ‘roll’, instead of adding them up or deleting the previous result, handy when you need a couple of dice results to pick from or assign to different tables, or using the 9 rolls system of character generation. Also, you can use the d100 roll to make strike rolls, hazard checks or determine implants and mutations all without breaking out your plastic dice and attracting unwanted attention from tsk-tsking, unenlightened non-gamers. Finally, what dice roller out there has a d1000? This baby can handle that prime mutation table on page 58 of the TME Hub Rules, roll for damage from a heavy laser cannon, or be used for rolling mutant names or personalities from these free supplements in the member's area. 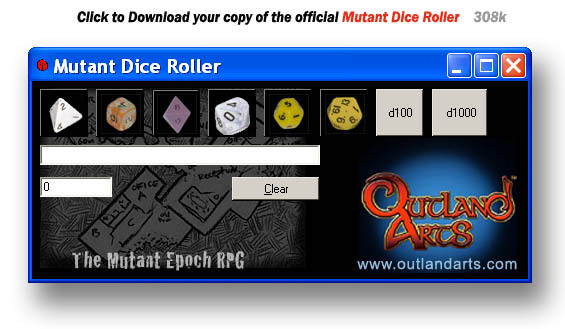 Please feel free to distribute this dice roller far and wide and spread the word about The Mutant Epoch. Special thanks to Jon McAusland for the design and development of this roller.